On the Victoria Day long weekend of 1974, the Woods of Leaf Rapids (Mom, Dad, me and Dad's cousin Hugh, his wife Diane and their children William and Carol Ann) decided to drive down the ramshackle trail that led to the Suwannee River for a weekend of camping. It was our first trip to what eventually became the Suwannee River campground, and it was a memorable one. In these days there wasn't actually a formal campground yet, nor a proper road, just a trail carved through the trees. 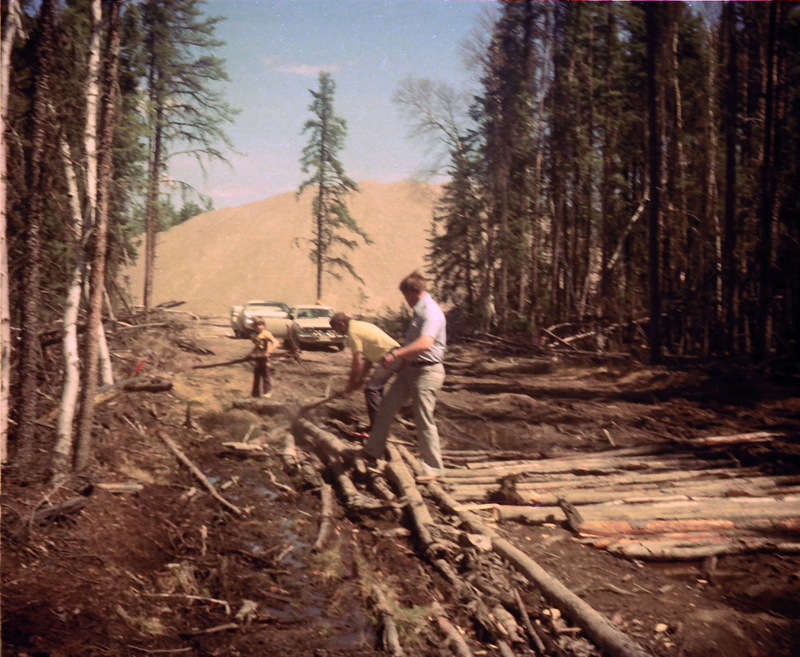 As we approached the river, we ran into a formidable obstacle: the trail had been washed out. There was no way our cars could get through. Fortunately, living in the north had honed everyone's survival skills (or at least our "I still want to go camping" skills). Everyone climbed out of our cars and we ventured into the forest for deadfall, collecting tree trunks and logs and then lining them up across the washed out section of trail to create our own makeshift bridge. Being only five years old I wasn't much help, but I vividly remember stomping around in the mud and tossing a few sticks onto the growing pile. I don't remember how long it took us to build our bridge, but as a child it seemed like a very long time indeed. But eventually Dad and Hugh declared the deed done and we re-entered our cars. Would the bridge hold, or would the old, dead wood split and splinter, sending our cars sinking into the quagmire? I stood up on the seat and pressed my hands to the window, eyes wide, watching as Hugh and Diane's Datsun bumped and bounced along the bridge, flattening the logs into the hungry mud. But at last they made it to the other side, and it was our turn to cross the sticky chasm. Our vehicle was larger and heavier than the Datsun, and I watched wide eyed, bones rattling as our wheels jounced and wobbled on the span. It felt as though we were sinking, but I wasn't afraid; this was a great adventure. Perhaps the bridge would collapse and we'd slowly sink into the earth, saved only by the intervention of our cousins, hauling us out through the Plymouth's windows at the last possible second! It didn't happen that way. In a matter of seconds we, too, had safely crossed, and minutes later we were at the campsite - really just a few clearings for vehicles and a rather disgusting outhouse. But though we had to BBQ with our mittens on, it was still a pretty good weekend. In later years the people of Leaf Rapids would build a real campground, with proper washrooms, picnic tables and fire pits, only to abandon these facilities in the late 90s as the town slowly withered. Nature has long since reclaimed the site, so visitors attempting to visit the original Suwanee campground today (there is today another, much smaller campground at another spot on the river) might very well have to do what we did back then - engineer your own means of making your way down to the river. But you might find the destination well worth the journey. I really enjoyed this post - and I didn't know we had a photo of this. Great!